Cutting puppy nails doesn't have to be traumatic - even if they are tiny nails on a wriggly paw! Like humans, puppies and dogs need to have their nails kept short so that they don't break or tear. Puppy nail trimming usually only needs to be done once every 3 or 4 weeks. 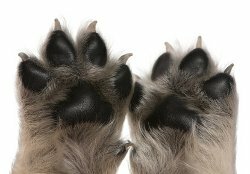 If your pup is active and spends a lot of time outside, goes for regular walks or runs on concrete or asphalt etc., his nails will wear down naturally, and nail-trimming won't need to be done so often. Nails which aren't trimmed regularly are uncomfortable for your pup, and eventually could cause real pain and sometimes inflammation. or more serious issues with the bones and joints in his toes. 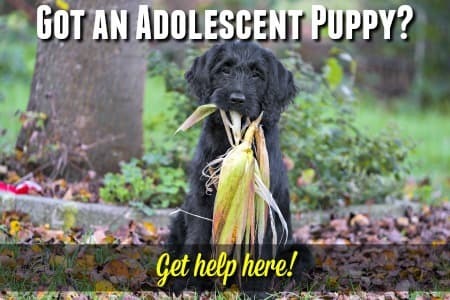 However, if your little guy spends all his time indoors on carpeted floors, or being carried around, then cutting those little puppy nails is most likely going to be a regular chore - so getting comfortable with doing it is important. It's worth getting your pup used to having his nails cut at an early age. Start when he's 7 or 8 weeks old, and it'll make the whole thing a lot easier. Most puppies and dog's don't like having their paws touched, but nail-trimming requires that you hold those tiny feet and toes - so it's important to get him comfortable with this. If you make a habit of holding his paws gently, one at a time, whenever you're playing with him then Fido won't find nail trimming such a strange experience. Make sure you have the right equipment! You need a good pair of nail trimmers. There are many available on the market, the guillotine kind with the safety guard are my favorites. 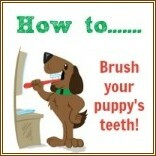 If your puppy is a toy, or small breed you can use human nail clippers, or cat nail clippers. A dremmel or nail grinder is another useful tool for puppy nail care, but the noise and vibration is sometimes a bit worrying for small puppies. If you choose to use one of these I'd suggest getting your pup familiar with the sound well before attempting to use the tool on his nails. A regular nail file (I like glass nail files over metal because they're much more gentle and yet very effective) can be used to take the rough edges off nails which have been trimmed with clippers, or even to shorten the nails of small puppies. This glass nail file by Little Blue Dog is perfect! If you should cut the 'quick' the part that supplies blood to the nail, it will bleed (sometimes quite a bit) and it's important to have something on hand to stop that bleeding. Styptic powder is readily available and will stop any bleeding very effectively. Cornstarch is a home-remedy alternative to styptic powder and works pretty well too. You might also want to get someone else to give you a hand for the first time or two. Keeping those little paws still is easier when there's an extra pair of hands. Get little Fido familiar with the clippers before you start. If your pup has never seen a set of nail clippers and/or nail grinder before it's not unusual for him to be a bit wary of it at first. Especially if it's close to him and makes a noise! To help little Fido feel comfortable before you actually start the nail-cutting process, show him the tool/s you're going to use and let him sniff and explore it. Hold a (tiny) tasty treat in the same hand as the clippers and he'll find his reward while he's investigating. Replace the treat when he's eaten it and let him do this four or five times before you begin. Cutting puppy nails on medium to large breed pups is easier if you hold little Fido in your lap, tucking his body into the crook of your arm and keeping your hands free. For tiny breeds or very young puppies you can hold them on your lap, or on a table/sofa. 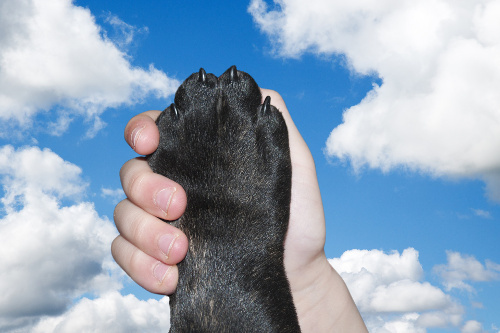 Grip your pup's paw gently, push back any hair growing around the nail, and lightly squeeze the paw pads to separate his toes. Then trim just the very tip of the nails, one at a time.... that way you won't risk cutting into the painful 'quick'. Be slow, patient and gentle. If your little one has clear or light colored nails you'll be able to see the pink line of the blood vessel which runs through it. This makes it fairly easy to avoid cutting into it. If little Fido's nails are black and you can't see the blood vessel, it's important to aim to cut just below where the nail starts to curve downards (see video below). Don't forget the dew claws (if your pup has them), they need trimming too. Talk to him gently as you work on his feet so he feels comfortable. It's best not to force the issue too much, your goal is to get Fido to like, or at least tolerate, this procedure. When it's done, give your puppy lots of praise and a treat - maybe even a short playtime. If you do happen to nick the quick, don't panic.. it looks worse than it is. 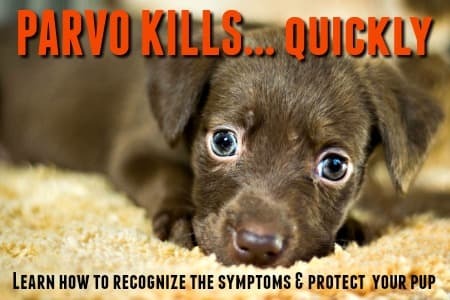 Your puppy will squeal because it hurts, but it's not an emergency. Just use the styptic powder to stop the bleeding and give him lots of cuddles and reassurance. You might want to leave the rest of the nails for later on, or the next day though as he'll be extra jumpy for a little while and you don't want to risk hurting him twice. Professional nail clippers designed specifically for small pets including puppies, small breed dogs, cats and kittens. High quality stainless steel blade for long-lasting sharpness. Comfortable handle and safety guard. Safe and effective treatment for bleeding caused by nicking the 'quick' of your pets nails. Used by professional groomers and safe for dogs, puppies, kittens, cats and birds. A must-have when cutting puppy nails. Basically a motorized, hand-held nail file which wears down the nail rather than cuts it. Super quiet operation. Adjustable safety guard for accurate nail trimming. Two speed design and three types of sanded bands. 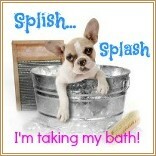 * Some pups don't like the noise/vibration/heat of having their nails filed. Starting when young is recommended. A glass dog nail file which gently smooths and shortens your puppy's nails. This file is a comfortable size and weight, easy to use and fully washable. It will usually last a long time, but remember, this file is made of GLASS, so this will break/shatter if dropped onto a hard surface! 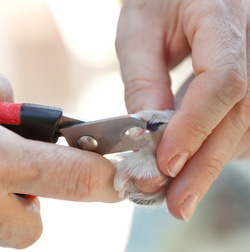 If you find that it's too stressful for you to trim your pet's nails, you can always take him to the groomers to have it done - or ask your vet to do it at a routine appointment. But honestly, it's not too difficult - and the first time is the most nerve-wracking!